A fork-lift truck driver unloads aid from one of the trucks that crossed from Tunisia to western Libya. 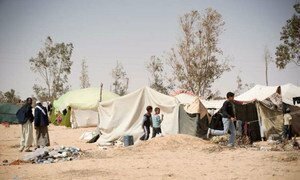 The United Nations refugee agency said today it has, for the first time, begun sending aid into western Libya from Tunisia to help some of the tens of thousands of people displaced by weeks of fighting in Tripoli. A first convoy carrying urgently needed medical supplies and relief items from the UN High Commissioner for Refugees (UNHCR) was organized by the International Medical Corps (IMC) on Saturday. The IMC also sent a second convoy later Saturday of essential medicines and medical supplies to the displaced, who are living in very difficult conditions, UNHCR said. Members of the Taher Al Zawia Organization have been distributing the aid. Yesterday, the UN Support Mission in Libya (UNSMIL) condemned the “grave escalation” in the fighting in Tripoli and its suburbs and urged all parties to work towards an immediate cessation of hostilities. The United Nations mission assisting Libya today condemned the grave escalation in the fighting in the capital, Tripoli, and its suburbs and urged all parties to work to put an end to the security deterioration, which forebodes serious consequences on the humanitarian level.